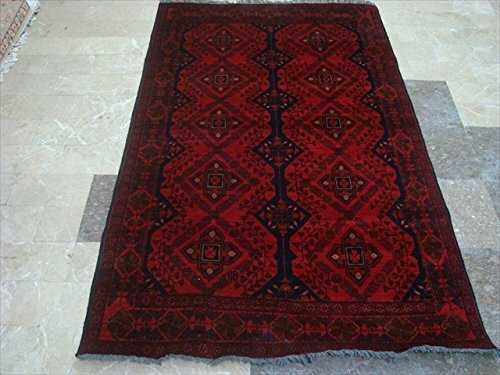 Exclusive Afghan Khal Muhamadi Dark Red Rectangle Area Rug Hand Knotted Wool Carpet (6.5 x 4.0)'. For the perfect combination of unique, beautiful style and high-quality durability, the attention to detail on these beautiful contemporary rugs is noticed as soon as you lay eyes on the carpet. Amazing red Afghan carpet made by Turkmens at the border between Afghanistan & Pakistan. This Khal Muhamadi Khamyab rug is the finest hand-knotted rug. These rugs tend to have quite a rustic motif with asymmetrical patterns. This is a genuine handmade rug woven in a natural dye. The deep reds in Khal Muhamadi rugs will compliment oak, walnut or any other dark and rich wood surfaces alike. Beautiful Khal Muhamadi design on the Multi Red background, easily compatible with the most home decor. Blended color schemes match well with all styles of furniture and art. Give your home an elegant touch with this amazing rug carpet. Great for any decor, adds texture to the floor and complements any decor. 100% Genuine Hand Knotted-Rug not hand tufted like other sellers.